The tunnel for Highway 60, leading from Jerusalem to all the settlements now designated the Gush Etzion bloc. 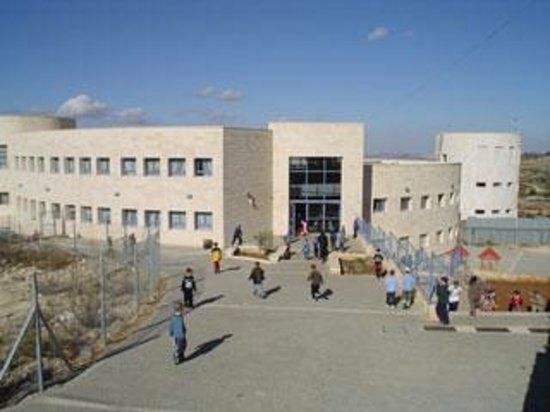 A religious elementary school in Kfar Etzion, the first settlement in the bloc. This, however, led to the fraud of attaching the name Gush Etzion to areas that had no connection to the original group of settlements – a fraud that was officially endorsed by the Israeli government in 1980, when the military commander of the West Bank officially declared the inauguration of the Gush Etzion Regional Council. From then on, nearly every new settlement between Jerusalem and Hebron was considered to be part of the bloc. An additional fraud was then introduced on a national scale. Legalistic arrangements were made in order to allow Israel to declare privately-owned Palestinian land “state land,” which was then turned over to Jewish settlers for development. Although the decision was denounced by the international community as illegal usage of occupied territory, the state’s legal guile was accepted by Israel’s High Court of Justice, giving the green light for building settlements atop private Palestinian land. In this new and artificially-inflated Gush Etzion, thousands of acres at once were declared “state land,” and were subsequently used to establish dozens of new settlements around Bethlehem. Beitar Illit, the largest settlement in the bloc. Elections in Israel are a time when politicians of all stripes, from Labour to Likud, declare their loyalty to the settlement blocs, and specifically to Gush Etzion. It is time to stop co-operating with Israeli propaganda, which tries to bestow upon every settlement that is falsely described as part of Gush Etzion the aura of the original Gush Etzion, as though it were more legitimate than all other illegal settlements.